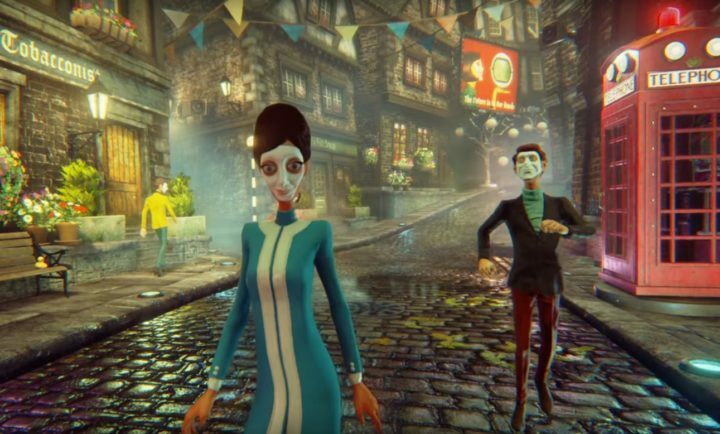 We Happy Few is a recently introduced game that created a lot of buzz at E3. Set in a dystopian 1964 England, the game makes paranoia king and channels elements of Orwell’s 1984 and also resembles Stanley Kubrick’s A Clockwork Orange. If you’re interested in the two, you’ll definitely love the game. If we were to use one word to describe this game, it would the word creepy. We Happy Few is set in the English city of Wellington Wells where all its citizens are addicted to a drug called “Joy.” The effects of this drug are easy to guess: it takes over your emotions, forcing you to deny your grim existence and forget about your not-so-clean past. This game is full of dark humor and paranoia is everywhere. The city inhabitants are all trying to hide a dark secret and struggle to keep up appearances, but chances are skeletons from the closet will eventually come out. As the majority of games are going into the future, such as Call of Duty, We Happy Few is one of the few going back into the past instead, creating an impressive environment using iconic elements to build provocative settings. We Happy Few is a survival roguelike, where you must learn to hide in plain sight among the Joy-happy citizens of Wellington Wells. If you act out of turn, or they notice you’re not on Joy, the locals will become suspicious and will rapidly turn your frown upside down! Forcefully. You will need to practice conformity, stealth and combat if you want to survive long enough to escape. We Happy Few is a survival rogue-like game where you must learn to hide in plain sight among the Joy-happy citizens of Wellington Wells. If you act out of turn or they notice you’re not on Joy, locals will become suspicious and will rapidly turn your frown upside down — forcefully. You will need to practice conformity, stealth and combat if you want to survive long enough to escape. The game will be released this year and Xbox One Insiders will be able to test it out starting June 26. For more information, you can visit the game’s official website.